Have we forgotten that like seasons and ocean tides, things tend to work in cycles? I’m not a student of psychology but I do enjoy reading the work and research of those who’ve examined this topic more deeply. In fact, several studies conducted over the last decade revealed an amazingly simple method of increasing happiness. It’s the practice of gratitudes. In 2003, Emmons and McCulloughin asked participants to write down 5 things that they were grateful for once a week for 10 weeks. At the end of the study, they concluded that those participating were 25% happier than a control group that simply listed five random events each week. In 2005, another study actually followed participants for a period of six months and had similar results. And interestingly, a third study comparing the effectiveness of daily gratitudes versus a weekly gratitude found the latter more effective. As the folks over at PsyBlog say, “the beauty of this exercise is that it’s so easy that it shouldn’t even be called exercise.” In order to get started, you need to find two minutes. Two minutes? Yes, that’s all it takes on a weekly basis to brainstorm five things that you are grateful for. These things can be as simple as the first taste of hot coffee in the morning to your child’s ability to perform Hunter’s Chorus in front of an audience. If you have more than two minutes, speculate on the causes of those gratitudes. The true benefit that this exercises creates is a sense of what we DO have as opposed to what we don’t. I have a scrumptious rose colored smoothie in front of me. I’m married to the best cappuccino maker on the planet. We watched my oldest son play amazing baseball this weekend. My winter garden is planted and coming along nicely. These old pink jammies that I’m wearing are soft and comfy. Put all ingredients in the Vitamix and blend away. The mixture of kale and beet give this a somewhat earthy taste which can be remedied with the addition of a carrot or more fruit. Mint is a nice addition also. Be creative. Be grateful. What a great reminder Tammy of all the blessings we have and how easy it is to lose sight of the wonderful things in our lives. Thanks – great way to start my day and I’m off to make my list! Good for you Susan! It is a good way to start a day – especially a Monday. Do you know about the rice-in-water experiment? I will try to find a link. Your smoothie sounds and looks delicious. If you don’t mind, I will use your gratitude list as the prompt for my post tomorrow. I would be honored if you would use it! I practice gratitude daily. I don’t always write down my gratitudes so this is a good reminder. I read an article that stated your mind can’t contemplate fear or anxiety and gratitude at the same time. I have found practicing gratitude has been a godsend for dealing with my anxiety. Just one more reason to make it a habit. 1. I ran with the dog at 5:30 am this morning and was so thankful for that extra hour. 2. I have a wonderful family. 3. I love our home and the beautiful view. 4. I am thankful for my health. 5. I am thankful for my creativity. You too Jeni and I think you might be right about our inability to contemplate both. Gratitude is a valuable tool to hone. The more we recognize the richness of our existence, the happier we become. Maybe the experiments on Hidden Messages in Water hold the key . . . When we remain mindful, fully connected with life and tuned in to the moment at hand, we catch the little gems of Ordinary Miracles as they are tossed our way. Life becomes less a chore, and more an exciting endeavor, when we enter the flow of life, with gratitude in our heart and a smile on our lips. I love the statement “gems of ordinary miracles”. It reminds me of Naomi Shihab Nye and some of her poetry about finding the sacred in everyday activity. THAT is really fascinating. I read a chapter in another book that talked about this. Dreams with Dragons or something like that. Do you know a song called “It’s a Beautiful World?” There is a great line in it, that after he has sung about the things he loves, then mentions a few of the drawbacks, he discovers that perhaps “This is as good as it gets.” He then goes on to repeat that it is indeed a beautiful world. One of my favorites. I’ll try to send the song to you or a link, anyway! Just watched it again. Teary eyes. It’s amazing how you can get such a strong sense of who he was. John, the song I sent to Tammy is “Beautiful World” and is performed by Colin Hay. It is one of my very favorites (the duo “Watson & Calhoun” performs it live frequently) and it begins, “My, my, my it’s a beautiful world, and I like swimming in the sea. I go out beyond the white breakers, where a man can still be free, (or a woman if you are one). I like swimming in the sea.” I believe that Colin Hay wrote it, but it might well be by the person you mentioned, but I don’t know. Perhaps we are speaking of the same song! So very sorry about the loss of your friend and co-worker. Those sorts of losses are very hard to accommodate into our lives. It is a good thing that he died doing something he loved. I will check out the sites you highlighted. Thanks. There was experiment with 3 glasses of water, the first one was showered with love, the second was shown gratitude and the third was put in the microwave. The results were that the water which had been shown gratitude had the highest increase in positive ions even higher than love! Needless to say the microwaved water had huge amounts of negative ions.. This is why gratitude is so important, every day. I will be celebrating Thanksgiving in Spain this year cooking dinner for the people I most want to thank… No turkey though!! Wow, everyone has heard about these water experiments but me. Fascinating! I’m very jealous of your Spanish adventure. Hope you’ll be blogging about it. I keep a gratitude journal by my bed. All I require of myself, a few times a week, is a phrase or a sentence. Repeating is fine. The simple power of some of these items has sometimes moved me to tears. Great idea to put it bedside so that you can bring closure to your day. Thanks for reminding folks to count their blessings. It’s easy to forget sometimes. You are welcome. Yes, it’s easy to forget. The other great thing is to replace the word wrong with the word missing. Instead of what’s wrong, we try to say what’s missing. That helps us focus on how we can create a different outcome. I am always grateful when others point out all I have to be grateful for. Thanks for your post! I’ve done the anti-depressant thing, and to be honest, just working on being a more positive thinker did more for me than those pills ever did. That plus your great diet must work well for you. Contentment is a great word. I like Hannah’s word of contentment. Great list – people, nature and music are fine gratitudes. Did you receive the song? I sent it to the e-mail addy on your contacts page. Not yet but I’ll check it later today! I am a firm believer of optimism and gratitude and do try each day to NOT dwell on all that went wrong but all that went right! Great list. Send Eddie and Larry my way! Gratitude is one of those things that are all about the move towards changing your perspective. So much is just in our heads, so much of our thoughts control us. Thich Nhat Hanh would say that you are nourishing your “positive seeds.” We each have negative and positive seeds in us. For instance, we all have greed, if we nurture greed, or allow others to make us more greedy, we can become a very greedy person. On the other hand, we also all have the capacity to be benevolent. If we nourish this “seed” of benevolence that benevolence grows and we become more of a benevelent person. The same thing with gratitude, it keeps growing the moment you focus on it. The same thing with unhappiness, the more time you focus on that, the more THAT grows. Anyways, you get the idea, I’m preaching to the choir here. But just wanted to recommend Thich Nhat Hanh to your readers. Great post! I love Thich Nhat Hanh. I’ve read several of books. It’s all so true. Victor Frankl said that “between stimulus and response, you have the power to choose”. In essence, it’s the same thing. More gratitude. More smoothies. More love. A lovely post , Tammy for all of the things we have to be grateful for,…! That smoothy is healthy & looks amazing too! Yes, here in the US, Thanksgiving is celebrated in November. Perhaps I should have waited for the actual holiday to post on gratitude. the gratitude exercise is powerful, because it of the outflow of love it generates. no diminishing! 2. a delicious latte made by my barista man! Sounds like we’re grateful for many similar things Nancy. And I like the way you’ve worded that “the outflow of love it generates”. what a great post!! i think being grateful also has to do with being in the moment, not stressing about past regrets, or “what will happen” in the future. also not COMPARING ourselves with other people (ugh, that’s the worst.) why do we always compare ourselves to those who have more, as opposed to those who have less??? I compare myself to those who have less weight ;-). You’re right about not worrying about the future. I’m doing some fascinating reading on that topic right now. It’s an issue for me. Tammy, this is a wonderful way of looking at the bright side of life. As with so many of your posts I am coming away with something I want to do regularly:-) Five things. I shall start tonight. That’s great kate! Thanks for the encouragement and yes, it is lovely to think of things in an abundant way. The fact that I get to live in Paris! Those all sound like pretty good gratitudes from my vantage point! What a great reminder, that we have the power to control our days by recognizing and giving thanks for what touches us. Great list Louann. Thank you. 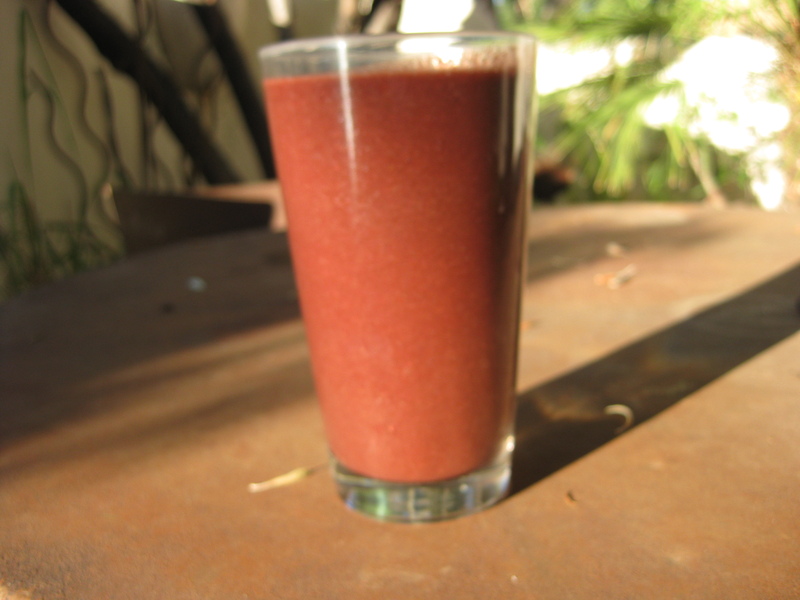 Great post…By the way, I am so intrigued by Kale and Beet in a smoothy! Woah! I must try this. 1) my brother and sister-in-law’s wonderful new baby. 2) the trees outside our apartment, and the creek that runs through our neighborhood. Great list Julia and do let me know what you think of the smoothie! I’m grateful, Tammy, that you left a gentle reminder at my blog to get my writing self in gear again! My first novel was done a year ago, and it sits collecting cobwebs as I write this. You’re a great model of writing muscle. Thanks for the encouragement. BTW, I’m planning to visit AZ in March. Shall I keep in touch about that? Of course you should! Good to hear from you. What a great post as we approach Thanksgiving! My family and I just created our annual ‘Tree of Thanks’, but we really should be grateful everyday for our blessings. Thank you for a good reminder! You are so right to remind us of all we should be grateful of ! Never take people or things for granted. I am grateful for my parents, sister and family. A shared phone call with my eldest son. Lots of laughter ! A touching letter received from someone, confined. Six doves that flew beautifully over my head on my way back home from the woods. A delicious meal coming straight from the garden. Writing this makes me even more happy 🙂 Thanks Tammy. You’re so welcome Isa. What a great list and the idea is that acknowledging it does make us more happy. Good list Dennis. The beauty of gratitudes is that everyone has something unique to them. Also, don’t forget to see the sacred in the daily things that you do. You remind me of the book The Art of Possibility where Ben Zander says something like – Never forget rule #6. And rule #6 is never take yourself too seriously. It helps in the complaining category.